After hundreds of years of obscurity, a manuscript from the 12th century has recently been discovered that details the rules for a role-playing game of historical proportions. Envisioned and enjoyed by medieval monks of some long-forgotten priory, their game will take you back in time to portray the brave knights, cunning outlaws, determined clerics, bold peasants, and brash barons of their age. Seek training from your mentors to advance in might. Use your skills, tools, and aspects to thwart your enemies and overcome character-driven adversity. 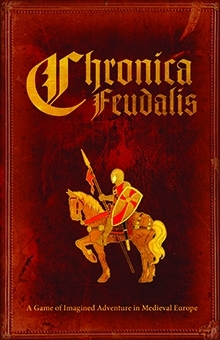 Explore the British isles and the European continent as they were in the feudal era. Turn the tides of wars and scheme for political power in old kingdoms. Join a crusade, survive the inquisition, become the monarch that the annals of time forgot. History is now yours for the re-telling. In Chronica Feudalis, you generate a character by picking the three mentors who have taught, trained and forged your protagonist into who they are today. Add up the stats, write a few aspects and you're ready to play. Your skills, the tools your protagonist employs and the aspects you designed are all rated by die type, ranking from d4 to d12. Roll the ones that apply and keep the highest result. Your protagonists can thwart their enemies in one of the four conflict arenas - combat, parley, subterfuge and chase - all based on the same core mechanics. As a game master, you'll control mentors, antagonists, agents and the simple. You can quickly stat these NPCs on the fly, sometimes simply by picking up a die. Is this considered the "Blue Knight" edition? The cover image shows a red knight though I read on a blog that the Drive Thru RPG site had been updated? So I purchased it figuring it was only $10 anyway, but if anyone ever wonders - as I did, it does indeed have the "Blue" Knight on the cover of the actual download.